The subject of Paul S Miller’s painting, artist Greg Warburton, has himself been an Archibald Prize finalist six times. His work is represented in the National Portrait Gallery, Canberra, and he has also spent many years working for people with disabilities. ‘I have known Greg for more than 20 years and admire not just the skill and intelligence with which he approaches his portraits and exquisitely rendered black and white drawings, but more importantly his deep curiosity for life and his great compassion,’ says Paul Miller. Miller was born in Canada and came to Australia in 1987 to undertake a Master of Fine Arts degree at the Centre for the Arts, University of Tasmania. Living in Sydney since 1989, he has held nine solo exhibitions in Australia and Canada. 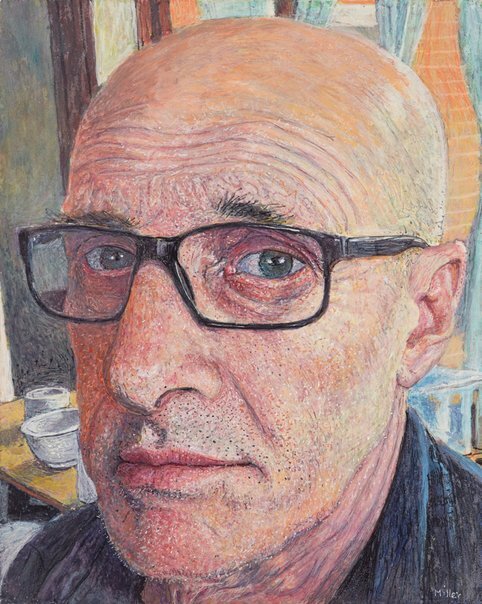 He has also exhibited in numerous group shows here and abroad and was a finalist in the 2005 Wynne Prize, 2000 Sulman Prize and 2013 Doug Moran National Portrait Prize.